Having three days off in a row can be a wonderful thing - especially when the sun is shining, the skies are a beautiful blue, and there are interesting things to take pictures of! This past Thursday was no exception as I bribed Amanda with ice cream out at Buttonwood Farm if she wanted to go for a ride with me to check out some old milk trucks that Renee, one of the ladies that I work with, had told me about awhile back. The trucks are located behind the old Broad Brook Dairy which was located on Route 165 in Preston, Connecticut and run by the Niewiarowski family. Back in the day, there used to be many dairies in the area that not only delivered farm fresh milk right to your door in awesomely cool glass milk bottles but that also sold farm fresh ice cream. I have very fond memories of my grandfather taking us to Norm's Dairy Bar in Jewett City when I was a kid and getting the best vanilla ice cream cones ever and I also recall visiting the Broad Brook Dairy from time to time, too. It seemed like just about every area had their own dairy store and I'm sure that many Preston residents happily remember when the Broad Brook Dairy was up and running for them to stop in at or when the dairy's trucks delivered fresh milk, cream, butter, and the like to their homes. There really was nothing quite like it and it's one of those by-gone things that I really miss. I was fortunate enough to live in an area of Canterbury that the Mountain Dairy out of Storrs still delivered to when the girls were little back in the early 90's and even though it might have cost a little extra to have milk delivered each week it was so good - and good for you - that it was more than worth it. Unfortunately all that remains of the Broad Brook Dairy, whose name is still barely visible on the old neon sign above the door, is a building partially torn down and three rusted milk trucks sitting in the back lot - the trucks that Renee had told me about. Stepping over what later turned out to be a flattened "no trespassing" sign attached to the flattened fencing in front of the building (oops! 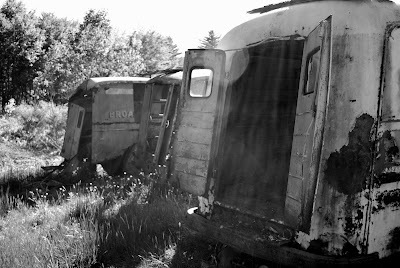 ), Amanda and I took a walk back towards the rusted remains of the trucks that were last registered in 1968 and had obviously seen better days! If trucks could talk, I'm sure that these three would really have had some stories to tell. Stories of the families that they delivered to, stories of the drivers who sat behind their steering wheels, and stories of their travels up and down the back roads of Preston. Unfortunately, though, these trucks weren't talking as they just sat still in a silent testament to an age when life was simpler and things tasted a heck of a lot better. 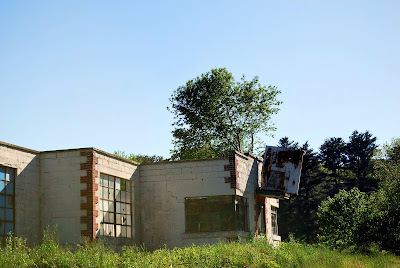 As I took pictures of the dilapidated trucks and the crumbling building I mentioned to Amanda that I had lots of happy childhood memories of going to places like Broad Brook and getting some of the best ice cream ever but obviously those days were long gone by. "So, how's it feel to be looking at your crumbling childhood? ", the almost 17-year old who will never have those kind of memories asked me. All I could say was, "Sad. Very, very sad." 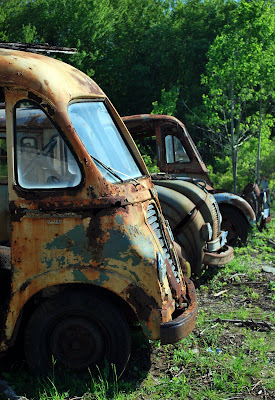 I do love these photos of the old yet beautiful delapidated milk trucks from a bygone era. There is a dairy farm in Oxford that sells homemade ice cream. I've only been there once, but I know it's a popular summer spot. 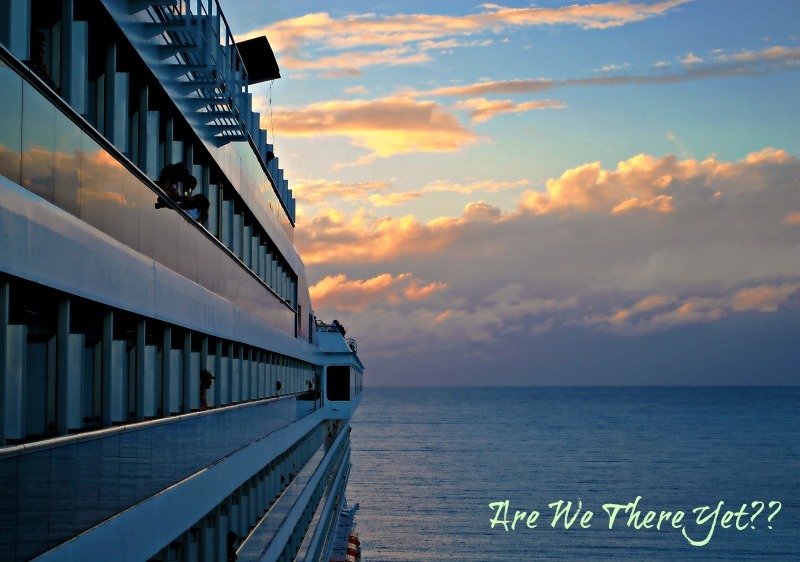 We can go there when you come to our neck of the woods! I can relate to your fond memories, Linda. The world sure is different than when we were growing up. Awesome day trip, Linda! You did keep an eye out for snakes and such, right? This reminds me of Hood's. When I was littel, my mother had fresh milk delivered everyday. I especially remember the glass quart jars and the round paper deal with a little tab to pull up. And how excited was I when they started delivery fresh lemonade and punch, too! That was a special treat, as mouths were many and moneys were few. I still have to get Hoodsies every time I come up! I loved the shot of the front of the three milk trucks. My step dad used to work at a Dairy Barn when we were kids. He worked with a man who had feet so big he couldn't buy shoes. He went barefoot everywhere, even in the cow barn! *gasp* I have lots of memories of fresh milk from the cow. Thanks for making me recollect this memory. oh i just LOVE those photos of the old trucks! Wow! These pics are so cool! You're right - these trucks WOULD have one heckuva story to tell...and I STILL say someone should write a fictious tome on these former neighborhood favorites! BTW: I feel your pain, Linda! I recently found out from my oldest friend that "Ryan's Market" in Wickford, RI (a village in North Kingstown where I grew up) shut down. Here was the last of the old-time markets w/the manual cash registers, and wooden "slides" that the cashier would use to manually push the groceries down to the bagger. The food quality, down-home service, and community-based attitude kept this store running for 100+ years! My friend even worked there while we were in high school, my mother & grandmother shopped there, and I remember going in all the time, and feeling the embrace of solid, hometown goodness. *sigh* Alas, like the trucks, the wooden slides & cash registers run no more...! Great pictures. You do find the most amazing places to photograph. You brought back memories, which I won't go into here. By the way, the Mystic Art Show thing will be coming up..........have you ever considered an exhibit of your photos? You and Amanda could share a booth. A little local exposure can't hurt. That was truly a blast from the past. Have a great Memorial Day weekend! Went there many times when I was little.